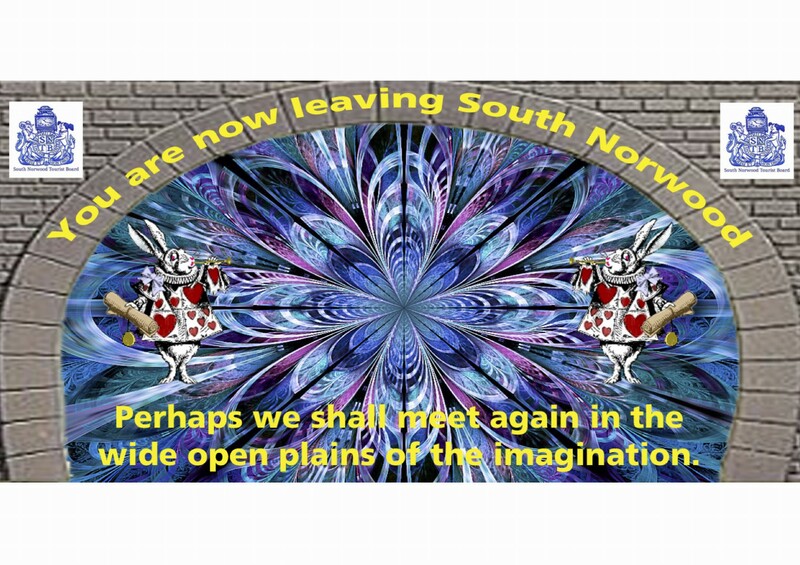 WHERE AM I – THE PSYCHEDELIC EXPERIENCE THAT IS THE WORLD FAMOUS ‘BUNNY HOLE’. On 14th February, by attending our ‘Tunnel of Love Lane Extravaganza’ you will be able to witness first hand the new range of SNTB ‘Celebrating South Norwood’ banners. One cannot say that us at SNTB are not concerned about people becoming confused -we recognise that people may experience severe disorientation when travelling through ‘Bunny Hole’, not realising which borough they are actually in. In order to resolve this issue SNTB have had several consultation meetings (at great time and expense I might add,) and feel that the most important issue is that people should always know when they are entering South Norwood and when they are leaving, so we (meaning Paul) have designed suitable banners that will be erected above each end of the ‘Bunny Hole’. We believe that these will enable people to know which burrow (borough) they are actually in, preventing complete confusion.